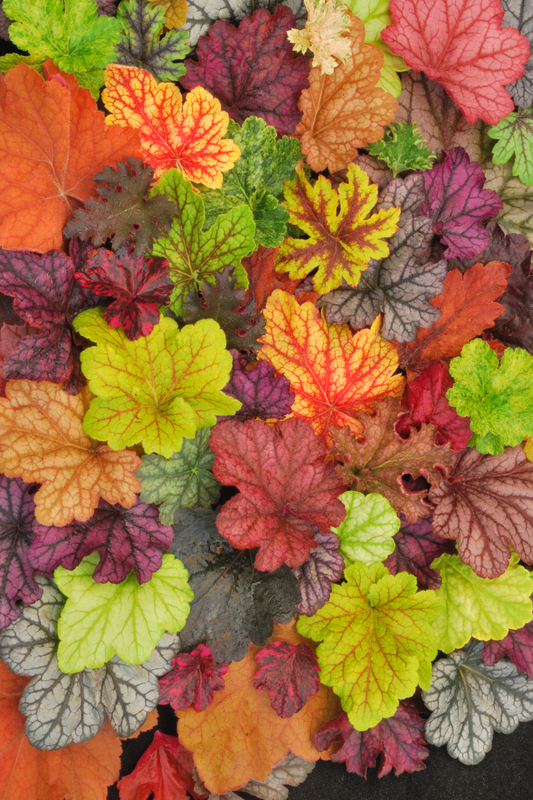 There are approximately 50 native Heuchera (hew-ker-ah) species, all from North America. Common names include alumroot and coral bells. Coral bells because of the terra cotta colored, tiny bell-shaped flowers that appeared on tall wiry stems rising above the basal foliage. . With a wide array of today's available leaf colors, including amber, burgundy, butterscotch, bronze, green, gold, purple, silver and yellow, plus many variegated patterns, Heuchera offers a subtle, refined beauty option for any garden. Leaf coloration of some varieties may even change their environment and /or the season. 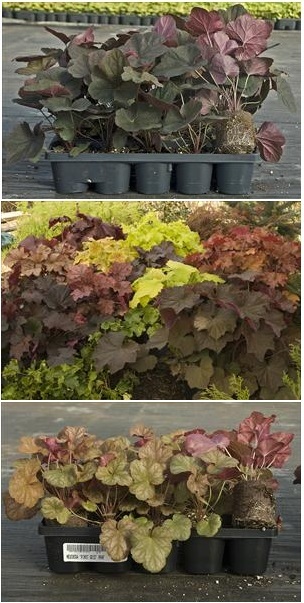 Heucheras are easy perennials to grow and fit nicely in the front of any border, rock garden, or container. They grow most vigorously and have the strongest colors when grown in partial shade (preferably afternoon shade). They can also be grown in full shade but their growth rate will be very slow. Some varieties can withstand full sun in northern climates if they have consistent moisture, but their colors tend to fade with the intensity of the sun. The soil should be amended with organic matter prior to planting. It should also have good drainage and a neutral pH. Heucheras are also salt tolerant. They are useful in northern zones along pathways which are salted in winter or for people gardening in coastal regions. Occasionally in northern regions, heucheras have a tendency to heave out of the ground because of the freeze/thaw cycle. To combat heaving, add an extra layer of compost around the plant's roots in the fall. In the spring, if the plants have heaved, the new roots will grow into the fresh new layer of compost.